Psychedelic plants have been used as mind-opening substances as far back as anyone can trace. Perhaps they were even responsible for the proverbial “big bang” in human consciousness about 100,000 years ago, which ushered in a creative boom in art, language, and expression visible in cave art and other artifacts. However speculative that may be, the truth is that the human species has evolved in the presence of certain plant medicines since the beginning and they continue to shape our view of the world. Today, we are experiencing a renaissance. The global availability, visibility, and distribution of so many things has pushed makers and creators of everything from whisky, to slime, to unicorns, to tarot, to art to step up their quality and quantity in response. Psychedelics and plant medicines fit into this category as well. Despite still being highly illegal, more sacred ceremonies, more late night dance parties, more backyard and living room explorations, and more research projects into the benefits and healing properties of these medicines are happening than ever before in history. We live now during a time of quickening and we need to continue to have a dialogue and push these boundaries ever forward. Hundreds of years ago, entering the mysteries was a highly ritualized process. Whether you were visiting an oracle and she was the one on a mind altering substance, or you were participating in the Eleusinian mysteries and experiencing a total group high, these were elaborately orchestrated events. Today we are fortunate enough to be able to craft our own rituals. We can still participate in a wide variety of sacred healing circles that pay homage to their cultural heritage, or we can acquire almost any substance we desire and try it out in the familiarity of our home. Yet despite these differences, we all still somehow go to the same visionary places that our ancestors did. Jung called this visionary realm the collective unconscious and described it as a part of our mind that we share with every human being. Terence McKenna, among others, described it as a different place, like tuning a radio to a different frequency. Experientially, I find it to be both deep inside of myself as well as a different place altogether, another dimension if you will, both within and outside of myself. There I connect not only to the Beings of the medicine itself, but a place where Forms and Archetypes reside and communicate in their own specific ways. This is what my painting is talking about. At the very bottom of the painting, the journey begins. There is the New Moon on the left and the Full Moon on the right. This is cyclic nature of the fickle moon that triggers stepping into something beyond ourselves. It is between this cycle that magic needs to be done and the world aligns in such a way to make our efforts even more powerful. The left, the feminine, is the dark; and the right, the masculine, is the light. Darkness and left is never bad, despite what a thousand years of church teachings claim, but in fact it is the absolute essential time where dropping deep into the mysteries can be accomplished. Think about it. For a ruling system to keep its subjects entranced by their own dogmatic ideals, cutting off the ties to each individual’s access to the mysteries is necessary; it is how you castrate the imagination. That’s how control works. By investigating the Dark and the Left Hand spirituality that is inherent within us all, we can immediately realize that access to deeper and higher realms is inherently within us and we don’t need a system in place to tell us how to get there at all. Continuing on the journey, we see the mushrooms emitting a spectrum of colors that is the symbolic path; the opening you will take as you move your eve upward along the painting. Follow the rainbow, as it were. 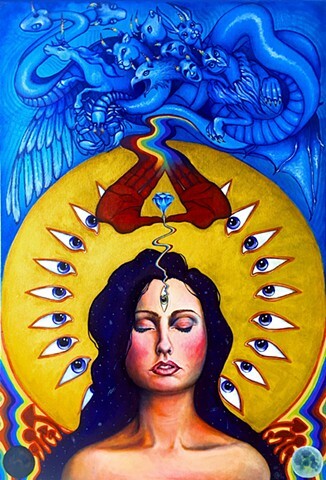 Our querent, a lovely young woman, has opened her third eye and the rainbow snakes upward toward the hands. Literally, it is a snake. If you look closely at the image, the rainbow here has a little snake-head that rests at the tip of the diamond. She is surrounded by a golden halo with eyes, representing not only the awakening of her consciousness, but also that we all have the Divine light within us as well. The hands, painted red ochre, have many meanings. The color is the one ancient peoples used to paint their dead before burying them back in the earth, letting them return to the womb, their Mother Goddess, to be born again. Women in India still henna their hands for marriage in honor of the Goddess as well. Hands are one of the things that makes us specifically human, and it is with our hands that we can create and destroy. These hands define an upward-pointing triangle shape, which indicates transformation. It is not necessarily the illuminati symbol the conspiracy corner of the internet says it means, but hey, I’m not going to tell you what to think. Within the hands is a diamond, essentially a triangle pointing downward. The two triangles within each other suggest the hexagram, the six-pointed star. I would have to devote an entire essay to this symbol alone, but suffice it to say, it is a highly spiritual, magical and transformational symbol for cultures throughout the world. The two triangles also are a combination of the male and female principles joining together for creation, which mirrors the New and the Full Moons at the bottom of the painting. What was once separate is now combined. Nothing says altered states quite like a hexagram. The hands and the diamond, the hexagram, act like the Great Work of alchemy, taking the mundane and altering it to be the Philosopher’s Stone. The Philosopher’s Stone is both a place within oneself as well as a place far beyond, exactly like the land which psychedelics take you to. It is both held in your hand and is a state of being at the same time. This is what it means by “mystery.” Understanding the fluctuating nature of this idea is exactly what sages, healers, and mystics have been trying to describe for thousands of years. The rainbow snake travels into the hexagram and expands both inwards and outwards, moving into the realms beyond. Here we encounter the collective unconscious, the realm of archetypes, forms, symbols, beings, deities, angels, aliens, you name it, for the first time. Remarkably, this place has a unique feel that is intrinsically our own, yet we are looking at things that many have seen before us. It’s as if everyone had their own camera lens that was just slightly different, but they were all looking at the same thing through them. Creatures like the Beast of Revelation, Unicorns, Scorpions, and Snakes all have meaning in this vast beyond. Snakes are universal symbols of the depths of our psyche as well as the vision that inspired the discovery of the shape of DNA. A Scorpion astrologically is the sign that is hidden in the darkness in the sky and is classically the witchy and the left hand point of view. Unicorns, in contrast, are the crescent Moon and stand for peace, harmony, and great strength. And last but not least, the Beast of Revelation is ushering in the new paradigm. Each creature has a horn or two that crystalizes the rainbow for the last time. This is where the vision has come to a point and the painting to an end. Each medicine journey comes to this point, something within the vision that is the true meaning, the message, if you will, that these symbols are trying to communicate with you. This is left to the viewer as well as to the querent and must resonate within the experiencer’s deepest soul. This is where the grandness of what we see through our unique camera lens reaches back into our Being and speaks directly to us. It is what we do with that message and how we chose to integrate it into our lives that is the real work. This act of reaching out and speaking directly to you is the power of symbols, archetypes, and visions. However grandiose and universal they are, they still humble themselves and speak directly to us in exactly the way that art can communicate to each individual viewer. I hope this painting says something unique to you.